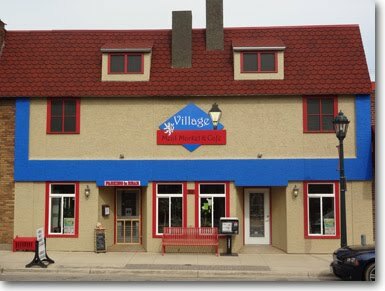 Welcome to Village Meat Market & Cafe! If it's legal...we smoke it! Lou Thompson has been planning the Village Meat Market and Cafe in Cedar Rapids, Iowa for years. Lou honed her skills down south while working in the restaurant and casino business before Katrina changed her life. Katrina brought Lou back to Cedar Rapids, Iowa where she dreamed of opening a cafe along with a meat market specializing in home made sausages to spur Czech Village's rebuilding from the flood of 2008. Lou's love for cooking and creating homemade sausages and her hopes to help rebuild Czech Village seemed a natural combination. Lou makes the best darn pork tenderloin in town and she has a scrumptious Czech menu with goulash and schnitzel. She has a smoked salmon that will knock your socks off. Lou has a little bit of everything. Come on down to Czech Village in Cedar Rapids, Iowa. Lou would love to show you her little piece of heaven!